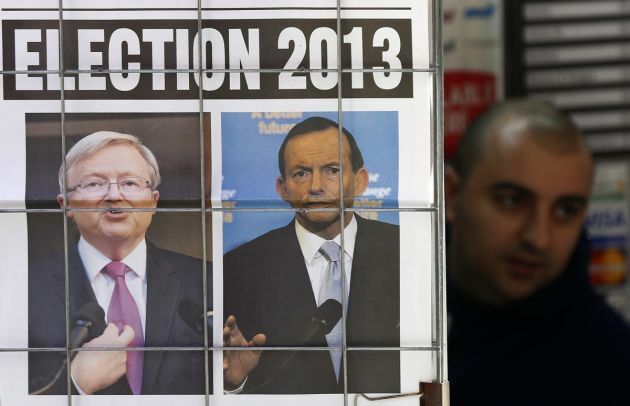 (Photo: REUTERS / Daniel Munoz)A man walks behind an advertisement for a newspaper with pictures of Australian Prime Minister Kevin Rudd (L) and opposition leader Tony Abbott in central Sydney August 5, 2013. Rudd called a Sept. 7 general election on Sunday, barely six weeks after he toppled former leader Julia Gillard in a party-room vote, ending a turbulent three years in power for the minority Labor government. CANBERRA (Reuters) - Australia's conservative opposition leader Tony Abbott, favourite to win Sept. 7 elections, launched his campaign on Sunday promising to build a stronger economy, putting bulldozers on the ground and cranes in the skies. Polls show Abbott is poised to end six years of Labor rule and sweep into office on a pro-business platform of restoring government finances and boosting investor confidence to help Australia adjust to an end of a prolonged mining boom. "We need a new way but to get a new way we have to choose a new government," Abbott told thousands of supporters in Brisbane in the northern state of Queensland, a key poll battleground. "We'll build a stronger economy so everyone can get ahead...I hope to be an infrastructure prime minister who puts bulldozers on the ground and cranes into our skies," he said. Abbott described the Labor government, which has run up record debt and budget deficits and which dumped Julia Gillard as prime minister in favour of Kevin Rudd just weeks before the election, as the "worst government in our history". He promised an Abbott government would revive business confidence, control government spending and bring about a faster return to surplus budgets, with surpluses to average around 1 percent of GDP within a decade. "From day one, it will be obvious that Australia is under new management and once more open for business," said Abbott. "By the end of a coalition government's first term, the budget will be on-track to a believable surplus." Abbott, 55, a socially conservative Catholic who once trained to become a priest, has a tough image as a super-fit and combative politician and has relentlessly attacked Labor for running up record debt. "But the worst deficit is not the budget deficit but the trust deficit. This election is all about trust," he said. In a bid to soften his tough-guy image two of his daughters introduced Abbott at his campaign launch on Sunday, describing him as an ordinary dad. Opinion polls show voters are slowly warming to Abbott's style. Abbott has slashed Rudd's commanding 14-point lead as preferred prime minister in July to just three points. Abbott also promoted the stability and unity of his team, in contrast to the leadership instability under Labor, which dumped Rudd in 2010 but then brought him back in June, prompting one third of Labor's cabinet to quit. "So my question is this: if the people who've worked with Mr Rudd don't trust him, why should you," Abbott asked voters. Abbott also promised to repeat the economic management of his mentor, former prime minister John Howard, who cut debt and delivered surplus budgets during his 11 and half years in office until late 2007. Howard was given a prolonged ovation when he took his seat at the front of the campaign launch. With both the Labor government and Abbott's opposition promising to control spending, both parties have run low-key election campaigns with few big promises, opting instead for negative attacks on each other. Abbott, elected Liberal Party leader in late 2009, has promised to scrap an unpopular carbon tax, which he blames for higher household bills and electricity prices, and to abolish a 30 percent profits tax on iron ore and coal mines. His centrepiece policy is a plan for a generous parental leave scheme, where the government will pay new mothers up to six months of their salary, capped at up to A$75,000, if they take time off to look after a new born. A lawyer and Rhodes scholar, Abbott cut his teeth in politics as a political adviser before he entered parliament in 1994. He served as workplace minister and health minister under Howard, who has been one of his strongest long-term supporters. Abbott said he would work to recognise Australia's disadvantaged Aborigines in the country's constitution and promised to continue visiting indigenous communities. "As long as I am in public life, I will continue to spend a week a year in a remote indigenous community as I've done over the past decade. Because, if they're good enough for people to live in, they should be good enough for a prime minister to stay in," he said.